Diamond grading and, by extension, valuing is actually a complex process. It’s not as simple as just checking the Four Cs, and grading it accordingly, the fact that the various cuts have undergone changes and improvements in cutting techniques means putting a value on any diamond is difficult. This is especially true with stones that pre-date mechanical methods that have even only rudimentary calibration applied. Diamonds that were handcut are, by definition, unique, as it just isn’t possible to recreate the exact same cut every single time. So how does that affect the value? An old European cut diamond is not dissimilar in its place in diamond history to the old mine cut stones. 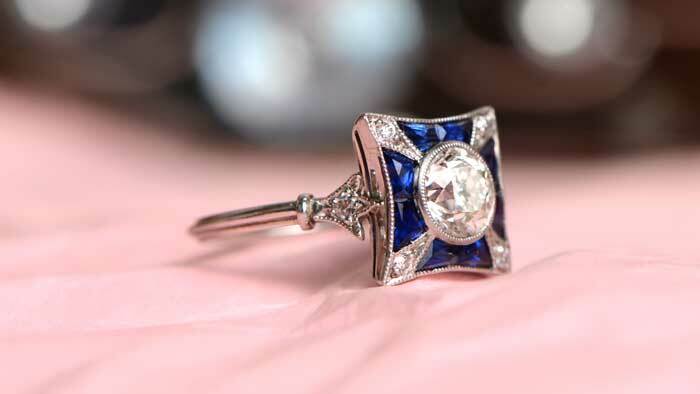 Whilst the old mine cut is the historical ancestor of the modern cushion cut, so the old European is the forerunner of the modern round brilliant cuts of today. Hand cut using the same methods as for old mine cuts, the old European cut lacked the laser-precision of its modern descendants, and so the problem of how to value such diamonds arises. Because of the laser-cutting process used on modern diamonds, there is absolute consistency across cut types, thereby making them relatively simple to value. In contrast, the hand crafted diamonds of the 19th and early 20th centuries cause great problems for those trying to attach a value to them, due to the slight variations present in all aspects from the crown to the culet. As a result of these problems, many old diamonds were re-fashioned to modern cuts, meaning the diamond industry was in real danger of losing a precious link to its own past. Thankfully, not everybody engaged in the update of existing stones, and efforts were made to try and ensure that the old European cut gets the respect it deserves. One of the valuation problems faced by dealers is that the variations of a hand cut stone mean they deviate from the modern standards of what constitutes perfection, significantly. This leads to many of them being graded as poor or fair, at best. In order to address this inherent inequality, the Gemological Institute of America (GIA) introduced a new circular brilliant cut for old diamonds, to take into account the fact that such stones should be measured by the standards of the time, and not modern standards. Although this does take some steps towards levelling the playing field, it can be argued that still more needs to be done to finally award the old European cut its rightful place in the history books, rather than as an often inferior product. A further broadening of the standard would help, or even the removal of diamonds of a certain age and cut to be exempt from receiving a cut grading altogether, so that they would be graded and valued on colour, clarity and carat alone. However, we are where we are and, in order to make sure a valuation is accurate, a dealer should be sought who not only has knowledge of the need to view an old European cut differently to a modern round brilliant cut, but one who has experience in identifying the differences in different diamonds and knows when to apply the new cut standards. Just knowing you have an old European diamond isn’t enough, you also need to know that a slightly different approach to having it valued is needed, and it might not be quite so simple as taking it to a jeweler for assessment. Instead, the age and methods used in the production suddenly become far more important. Modern methods do away with all the uncertainty, but hand cut and polished diamonds increase it significantly. What to some is imperfect, to others is a masterpiece. The avaricious drive to recut old European cut diamonds has made them quite rare, and so those that are left deserve their place at the top table.